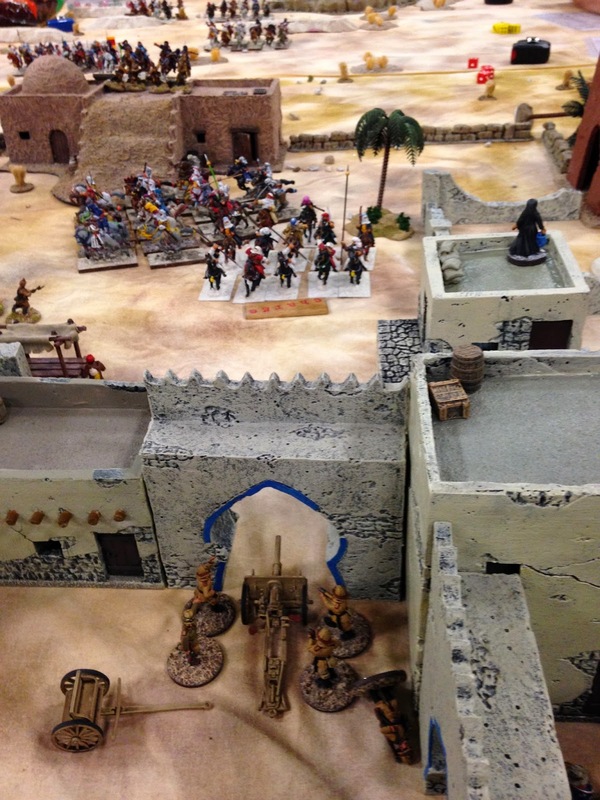 This game was run at the HMGS-South's Recon 2014 convention in Orlando Fl. on April 24th to the 27th, 2014. Here's the convention link. http://www.hmgs-south.com. The battle we played is the final engagement of the movie where the US Marines attempt to return Mrs. Pedecaris to America and the Riffian Berbers attempt to free the Raisuli while the Bashaw's forces and their German and French allies try to prevent his liberation. As you have probably figured out by now we are HUGE fans of the rules set, The Sword And The Flame, we have used the TSATF 20th anniversary edition in 25/28mm scale for this game. A recent post on TMP about this game prompted this blog entry. One of my club mates Bob wrote up a great AAR for this game so I have decided to use his version of the battle to tell the story. I have asked other players if they wish to write up their own AAR and if it happens I will post those AAR's as well. I have added pictures to the AAR which show the details described. I know Nick and I had as much fun running this game as the players did playing it. We have been asked to run the game again, and we will at Hurricon 2014. Please see the above attached link for details of the con. What follows is an AAR by Bob Walton with a few comments by me under some of the photos. 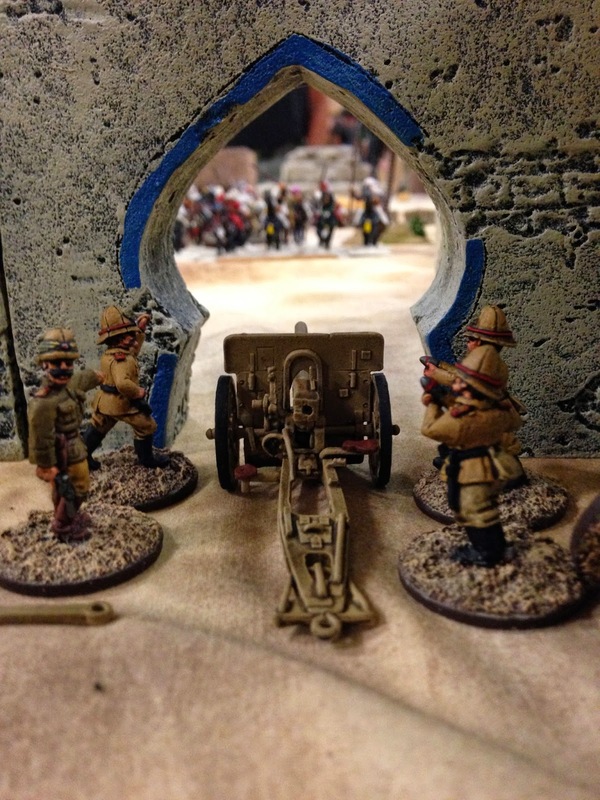 An AAR by Bob Walton: Herewith, my after action report from an earlier e-mail to HMGS South. Jeff will be running this again at Hurricon 2014 in September (Orlando). "La pièce de résistance was Jeff Baumal's rendition of "The Wind and the Lion", along with assistance and figures from Nick. This movie has to be one of the best films for us history/action junkies, if perhaps one of the least known. If you have not seen it, rent it or buy it. Now. Soundtrack is awesome. Yes, I brought the CD but no one had a CD player. Can anyone spell MP3? Apparently not an old fart like me. Jeff had set up a very nice TSATF 28mm recreation of the village battle near the end of the film in which…wait, spoilers…the Raisuli was held captive. In play are American Marines there to rescue Mrs. Pedicaris and her two children; the Germans were there, along with the Basheer's Guard, to keep the Raisuli "from harm" (aka captive); the French (a cavalry unit allied with the Germans…wait, what? ), and of course hordes of Berber cavalry mad with rage and intent upon rescuing their leader, "Mulay Ahmed Muhamed Raisuli the Magnificent, Sherif of the Riffian Berbers". [Yes, I have watched the film too many times.] The Berber cavalry come charging across the open desert in mass, screaming and waving their spears, swords and rifles when BOOM!, the German 77mm opens up, tearing holes in the advancing heathen (12 D20s if you are curious). As the Berber horsemen approach the outlying wall, the German infantry along the inside hold, and extract their pound of flesh from the horde in a firing line, then the Berbers hit home in melee. The German lads still hold their own (for the moment), but already Berber cavalry stream in over the wall on the right as horses come jumping in over the dying Soldaten…only to be met with another BOOM! from the other 77mm on the German right, blasting a gaping hole in their advancing cavalry. The first wave is grinding to a halt but for every Berber killed another spawns, so more units come in off the desert through the sand and smoke and haze of blood. And then we have some spectacle. The French. Ah the French. They have been milling about deciding what to do, que devons-nous faire?, and with a blare of shiny trumpets, the impeccably uniformed horsemen begin pouring out of a gap in the wall on the Berber right with cries of vive la France! The Berbers are not quite sure what to make of them, and simply charge by. The French appear to be content to watch them do it, and continue their parade maneuvers. Meanwhile, the US Marines are leading Mrs. Pedicaris (or is it the other way around?!) to where the Raisuli is held prisoner. Not wanting an international incident, neither the Germans nor the Marines fire on the other, but watch each other tensely, as do the Basheer's Guard alongside their Pickelhauben Brüder. Who is on who's side here anyway? Ach du lieber! The Berber onslaught continues as the Germans "advance to the rear" in good order, making morale roles and holding their own against the rising tide (but seeing the inevitable end). In a truly remarkable "movie moment", the Berbers charge full tilt into the German gun on the right. In a furious melee, the Germans hold their own until no one is left but the officer in charge of the German gun, who, still facing several Berber horsemen, manages in melee to dispatch not one, not two, not three but all four remaining Berbers, firing away with his Luger (and perhaps a borrowed Mauser C96 in his other hand!). The smoke clears and his team returns to the gun, which retires to a protected arch to take on the next wave. The Germans cry "Für den Kaiser!" 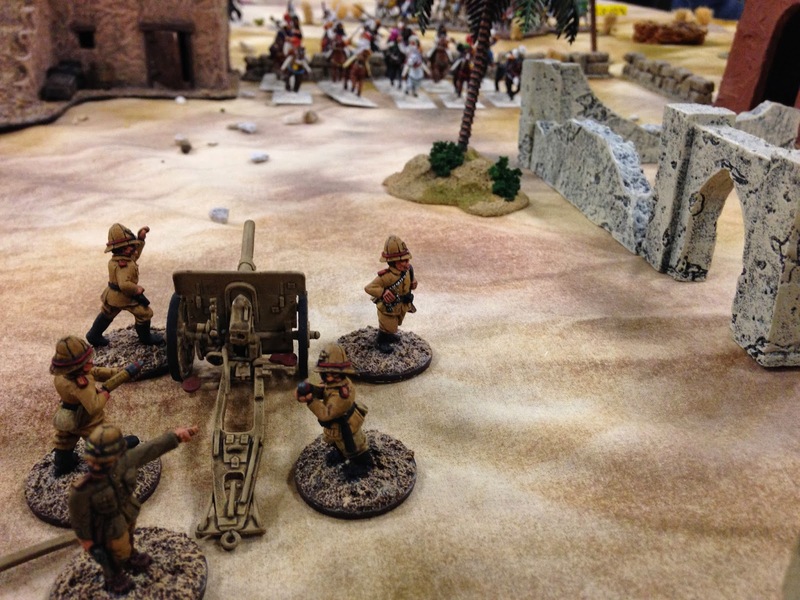 Then the Marines line up behind the German gun in support of..no..wait…BLAM! The Marines fire point blank into the German gun crew!! Was zum Teufel?! Sie sind alle verrückt? Where is the honor?! Wounded, surrounded by the dead gunners, our gallant German officer is carried from the field. Ein Eisenkreuz für diesen Mann! Gloves off now, the Marines and Germans go at it, but with a new, covert contingent of Berbers piling in through an unguarded gate in the rear to aid in releasing the Raisuli, and Berber cavalry now flowing in unchecked from the front, the end is nigh. The Germans and their allies have made it to turn 10 but the situation is deteriorating too quickly to hold on any longer. The jail is attacked as Major Faust cowers behind the sand bagged position! Berber cavalry closes in on the jail compound while being shelled by a German gun and being fired at by German Marines. The Marines have captured the right flank German gun and have turned it against the left flank gun! The Germans and Bashaw's troops are surrounded. But wait, the French! Where are the French cavalry? It's our only chance to last even one more turn (and meet German Victory Conditions). All heads turn, and watch, stunned, as out on the open desert, cantering in parade fashion, the French are riding away from the battle! 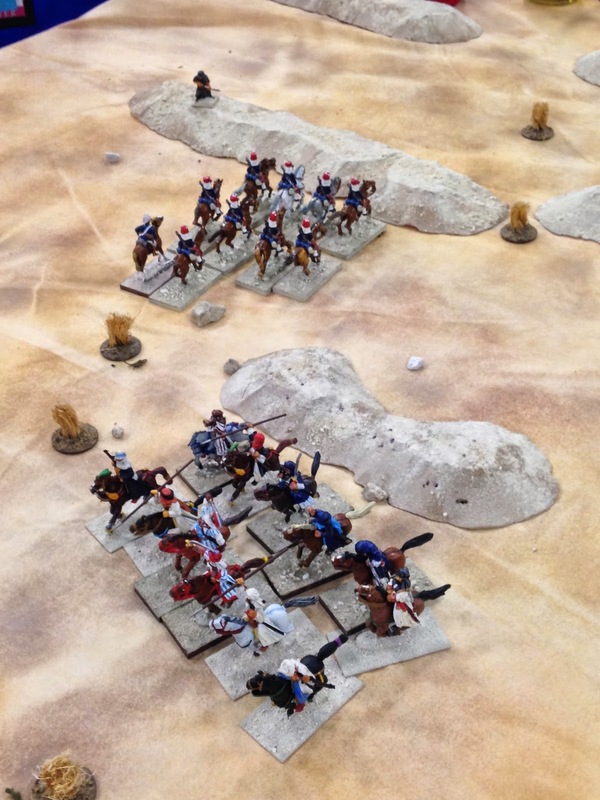 Without firing a shot, drawing a saber or taking a casualty – and especially without soiling their uniforms – the French officer declares a major French victory for France and rides off into the sands. Alle Hoffnung verloren, the Germans and their remaining allies collapse under the horde. The German commander aims his Mauser C96 at the Raisuli but instead fires in the air, showing his respect. Sensing the tide is totally turned, the remaining Basheer Guard look about and wisely fire into the air as well, in celebration of their Riffian Berber leader's freedom (as opposed to firing into the Raisuli as originally intended…). Meanwhile, the French unit is lost in the desert, never seen nor heard from again. 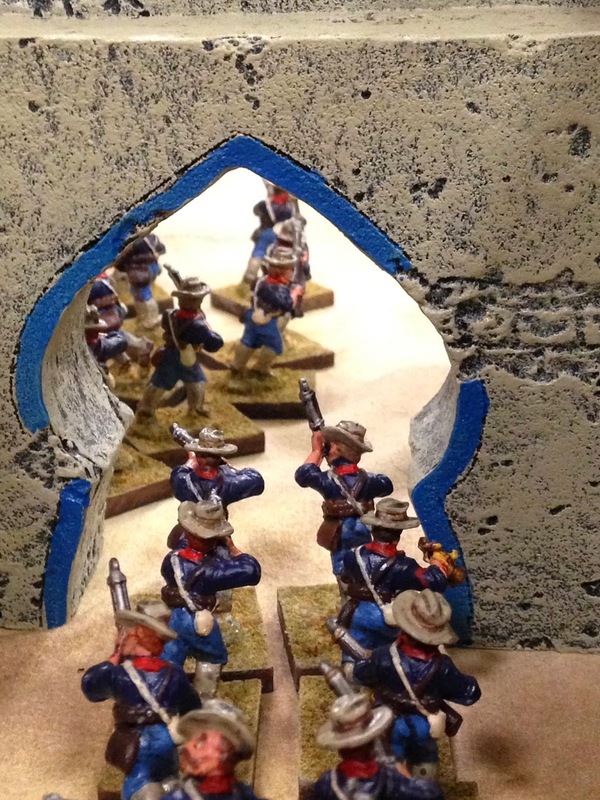 Perhaps not coincidentally, soon after a little cafe and bar is established at 248 Rue Sour Jdid, in Casablanca…"
The right flank gun has pulled back to the arch for cover after defeating the Berber cavalry in a brutal melee where the gunner officer was the last man standing to his gun, pouting accurate close range fire into the attacking mass. He was awarded the Iron Cross in hospital several weeks later. The Marines take positions in the vill as they try to outflank the Germans and the Bashaw's troops guarding the Raisuli in the jail. Custom made wooden game markers by "Last Stand Dan"! Left Flank German K17 Gun and Crew prepare to fire into the advancing horde. Right flank village tower made from foam core and wood filler. Beautiful! Sgt. Guinness, I wished I could join the battle in September! I just nominated you for a LIEBSTER award. Pop over to my blog and learn more about it when you get the chance. If it turns out you are just too busy to "officially" earn the award, no harm, no foul, my feathers will not be ruffled in any way! 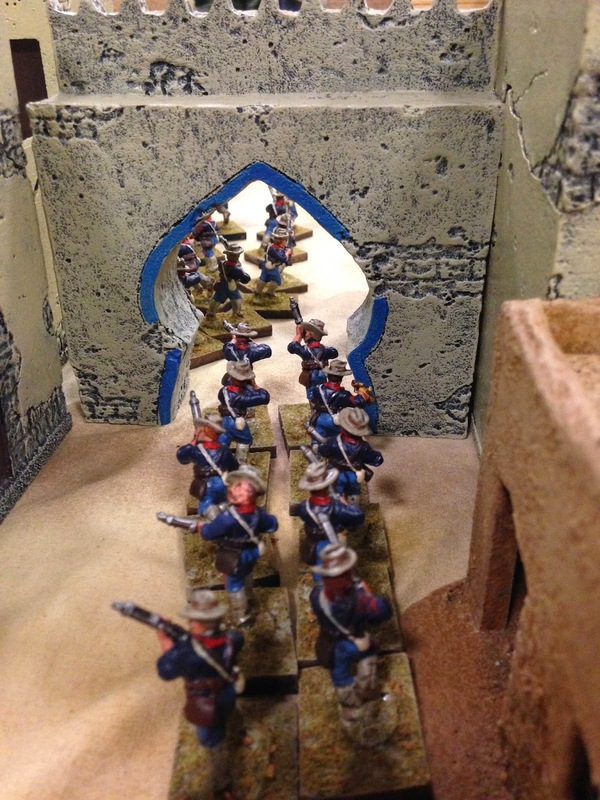 I hope you keep posting AARs and pics from your games, and sharing your sharp insights into TSATF specifically and colonial gaming in general! Well done, Jeff! Beautiful pictures, what a splendid terrain to play with! Very atmospheric, great work! I'm honored to even be considered for such an award, let alone amongst this group of such amazing and creative people. Thank you! I will do my best to live up to the standard that you and others have set, which has motivated me to create my blog. This really is such an amazing hobby. I have met so many awesome people, experienced so much, and learned more than I ever imagined in the 40+ years I've been involved. I will complete the nomination procedure ASAP. Thanks for stopping by. I wish you could join the battle in Sept.! Thank you for the kind words. These games are always huge fun!